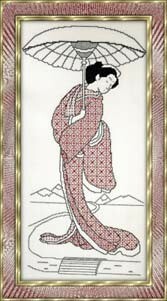 Oriental blackwork ladies just for you! Both of the ladies use seed beads, and if you haven't used them before my page on attaching beads may prove useful. These are downloadable patterns, so there is no need to wait for the post to arrive to start stitching! 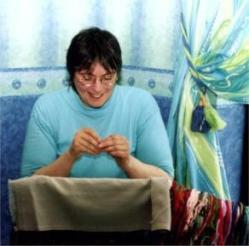 They are both fair sized designs which will provide you with hours of stitching enjoyment. If you haven't tried blackwork before, you might like to download my ebook, Blackwork for Beginners. Three shades of turquoise floss, silver metallic and turquoise seed beads are used in this splendid oriental blackwork design. Red and gold threads with the addition of gold seed beads create this oriental beauty.